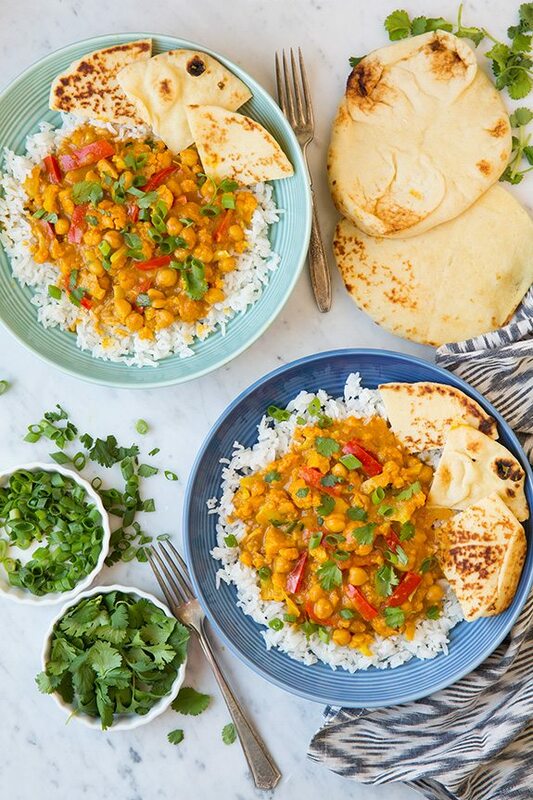 A Vegetable Curry that’s so good meat eaters and vegetarians alike will fall in love with it! Fresh veggies and chick peas are slowly simmered in a well seasoned sauce allowing time for everything to meld together so perfectly. Serve over basmati rice to complete the dish. 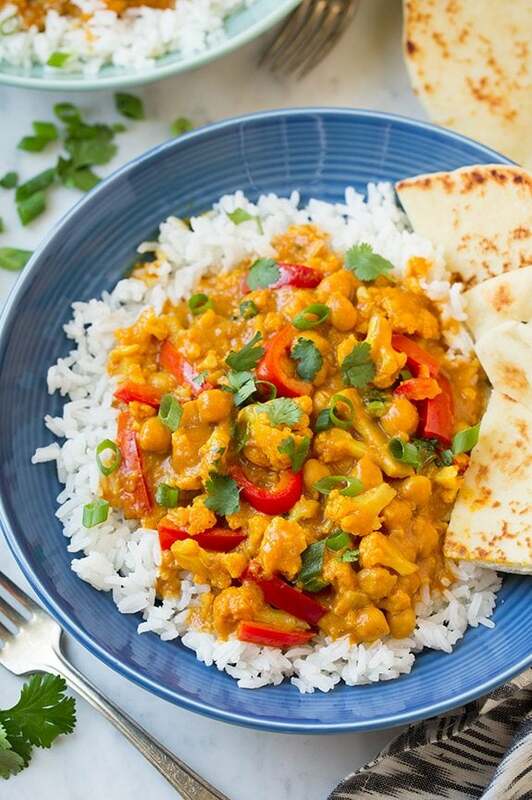 The Best Vegetable Curry Recipe! Who says you need meat to have an incredible meal? 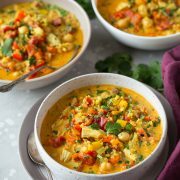 This Red Vegetable Curry is one my new favorite vegetarian recipes! It is perfectly balanced and flavorful and you won’t even miss the meat in the slightest. 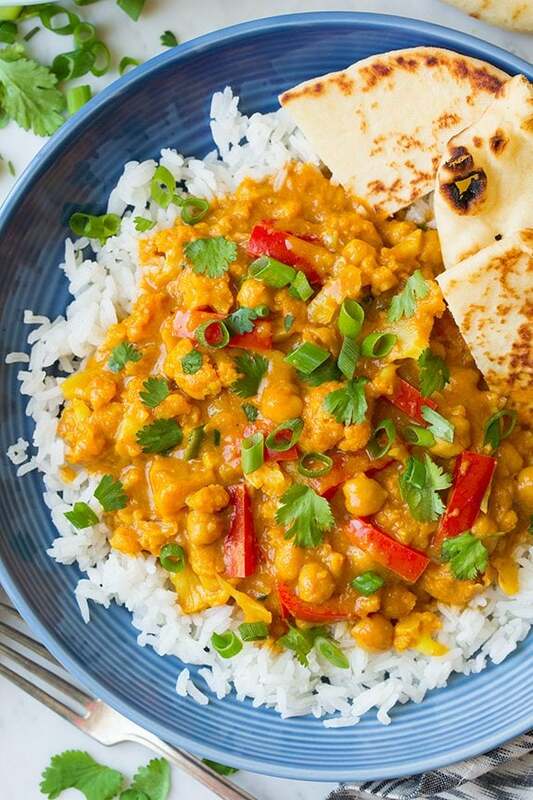 This is brimming with vegetables, a flavorful sauce and chick peas for protein. And don’t you just love those pretty natural colors? Saute onion, garlic, ginger, jalapeno. Saute curry paste and spices with it. Mix in 1/4 cup water then puree mixture in food processor. Toss in garbanzo beans, cauliflower, and bell pepper. Stir in vegetable broth, tomato sauce, and coconut milk. Boil. 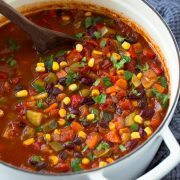 Reduce heat and simmer uncovered for 45 minutes. Serve warm over basmati rice, topped with green onions and plenty of cilantro. The recipe comes from the Heather Christo’s newly released cookbook Pure Delicious. 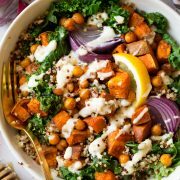 Heather Christo is such a talented food blogger and chef and I’ve been following her blog, Heather Christo, for years and I always love what she has to share! This cookbook has 150 allergen-free recipes and it shares a lot of helpful information about food allergies, plus tips on adjusting to a new found food allergy you may have. The book if filled with gorgeous photos that will inspire you to get in the kitchen and make something delectable. The recipes are easy to follow and I love that there is plenty of variety in the book. You can purchase a copy of the book for yourself from Amazon, or at Barnes and Noble. A Vegetable Curry that's so good meat eaters and vegetarians alike will fall in love with it! Fresh veggies and chick peas are slowly simmered in a well seasoned sauce allowing time for everything to meld together so perfectly. Serve over basmati rice to complete the dish. Heat 2 Tbsp oil in a large enameled cast iron pot over medium heat. Add onions and saute until nearly softened, about 5 minutes. Add in garlic, ginger and jalapeno and saute until softened, about 5 minutes. Add in the curry paste, curry powder, and cumin. Season with salt to taste and cook 2 minutes, stirring frequently. Stir in 1/4 cup water. Transfer curry mixture to a food processor and puree until smooth, about 2 minutes. Heat remaining 2 Tbsp oil in same pot over medium heat. Add curry mixture and cook 1 minute. 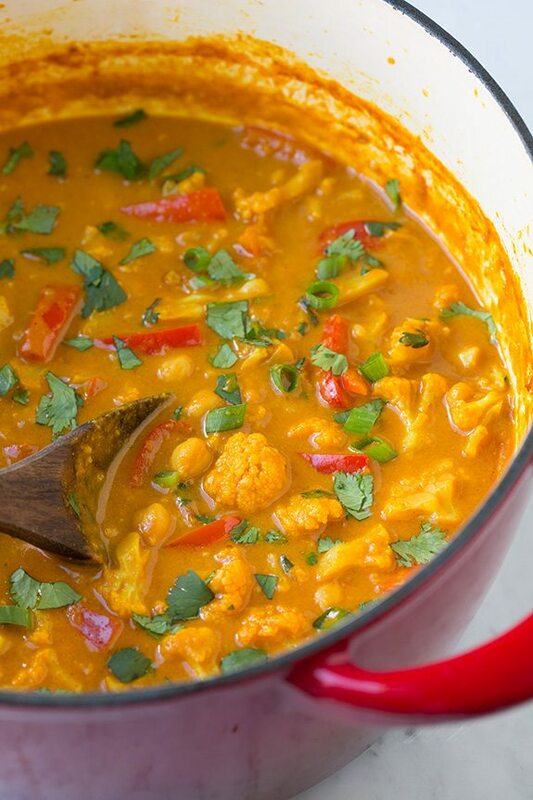 Add the garbanzo beans, cauliflower, and bell pepper and toss to coat with curry mixture. Stir in vegetable broth, tomato sauce, and coconut milk. Season with salt to taste and bring to a light boil. Reduce heat to low and simmer uncovered for 45 minutes, stirring occasionally (original recipe lists simmer covered for 30 and uncovered for 15, but I prefer a slightly thicker consistency). *Original recipe calls for vegetable oil.